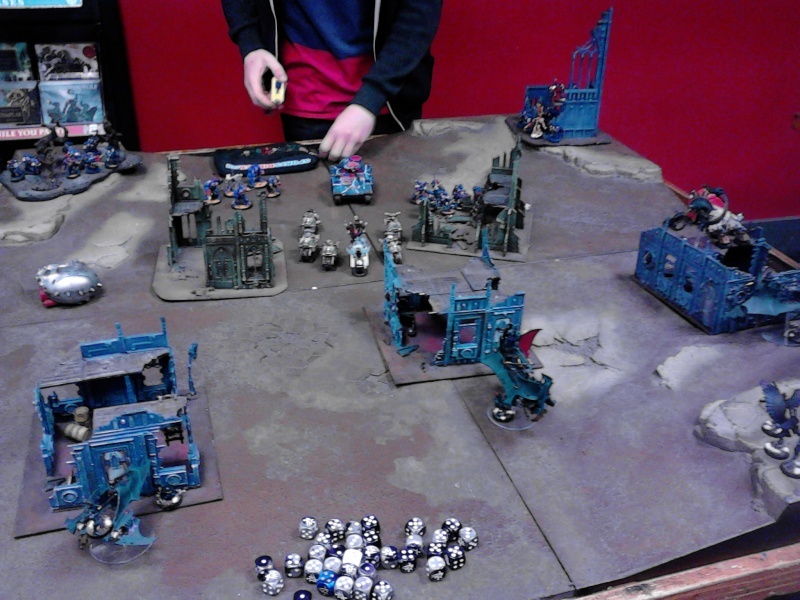 Night Lords are using mostly Nurgle rules to try and closest to fluff where possible, mostly so my opponent could take the Icon of Despair on things as that fits best for his Night Lords when using 40k rules. He's also gone quite heavily for quantity over quality. The game was Emperor's Will, and Chaos won the roll and elected to go first. His warlord trait was useless, whereas I got the one allowing me to infiltrate 3 units - I picked the wracks, large warrior squad, and Talos, allowing them to get up close and personal. He deployed his objective in a ruin to the far right corner, and I deployed mine diagonally opposite. 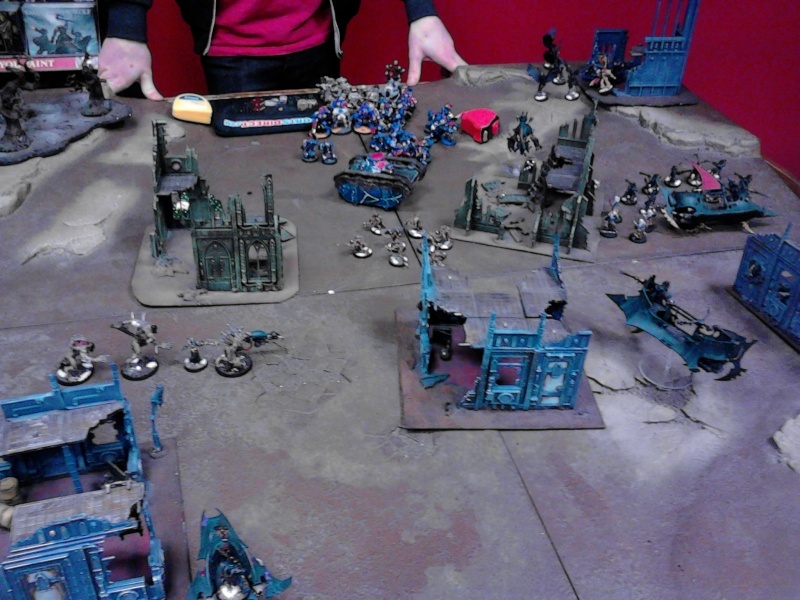 Everything infiltrated forwards apart from the venom and warriors, who stayed on my objective, and the Grots/Scourges, who were deep striking. The corner squads stayed stationary, whilst everything else advanced towards the waiting Dark Eldar. The powerfist marine squad is the central one, that's moving. He's able to get some shots on my raider in the centre (warriors) and on the Talos, but does no damage. Bikes turbo boost into my lines. After the first Chaos movement phase. The venom poked its nose out, and the talos rumbled forwards from cover. The mandrakes, occupying the same piece of terrain, moved up to the very edge to take pot shots. The raiders both moved slightly. 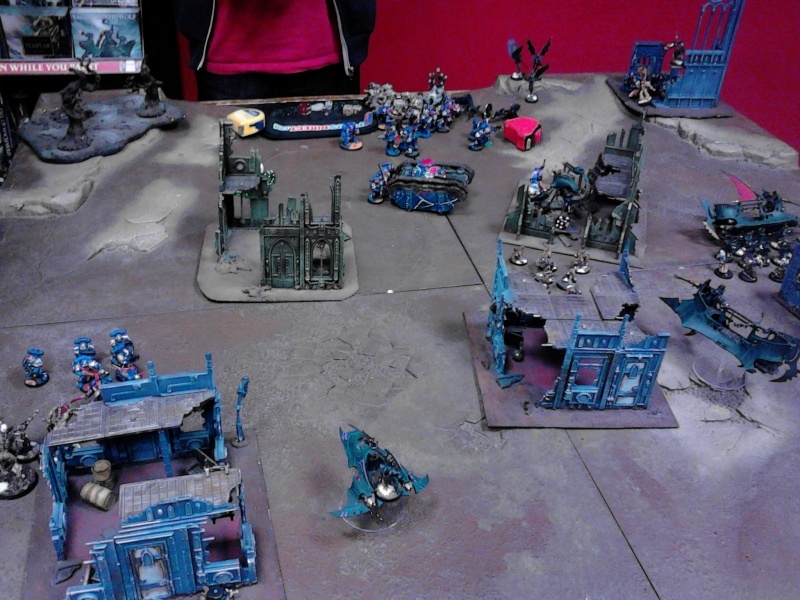 The warriors, venom, and venom passengers combined tossed out enough shots to annihilate the bikers for First Blood, and reduced the Chaos Lord to one wound. A dark lance shot took a hull point from the Predator, and the ossefactor killed a marine. The Scourges turned up, and scattered right to the rear table edge. The venom retreated just behind the ruin again. The Talos advanced on the vulnerable marine squad, and the wracks disembarked and moved to support. The warrior raider moved and went flat out to sit just over 12" away from the marines in the ruin, in an attempt to bait them out and launch an attack. 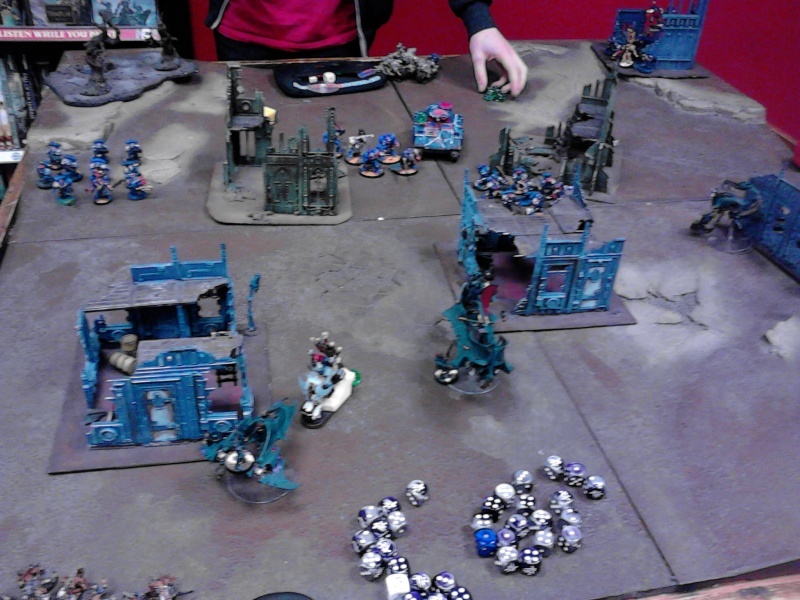 In the shooting phase, the venom cut down two terminators that it could see, including the autocannon, and a few chaos marines in the central squad were killed, including the champion with his power fist. The scourges managed to inflict a single penetrating hit with a haywire blaster, stunning the predator. The talos and wracks attempted to charge the chaos marines, with the talos taking a wound - it made it, but the wracks failed their charge. Incensed by the insulting wound, Geoffrey disemboweled most of the marines, and the surviving four fled, with the talos consolidating into the ruins. The fleeing marines rallied, and moved to a more central position. The left hand squad continued their mad dash towards the relatively unprotected objective, whilst the right hand squad wrecked the raider, and pinned its occupants. The terminators moved across and charged Geoffrey, and honours were even with a single wound inflicted apiece but negated by the invulnerable save and feel no pain. With a crackle, the haemonculus and his grotesques stepped forth from the webway, directly in front of the Night Lords attempting to take the objective. Two liquifier guns did little damage. The mandrakes moved out, using the pinned warriors for cover, whilst the wracks advanced. 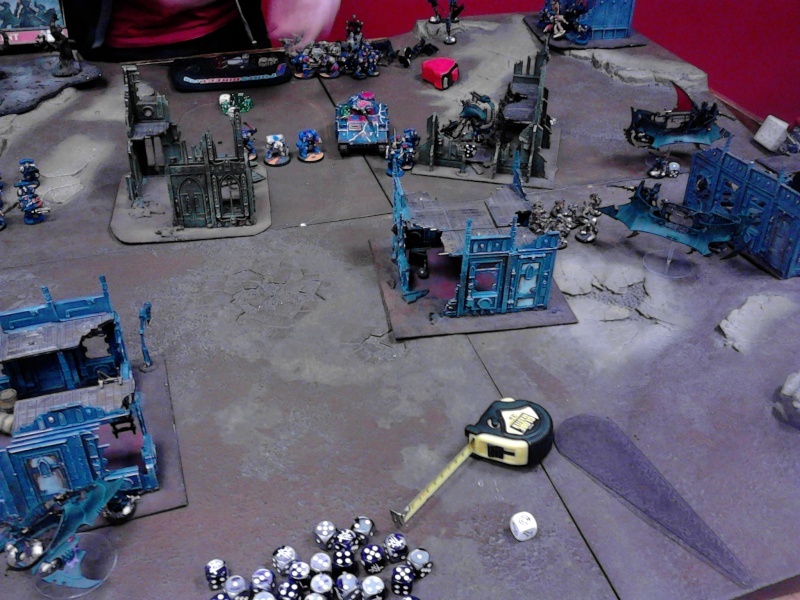 The Scourges were able to wreck the predator, a few marines were killed from each squad, and the smallest squad fell back again. The combat saw Geoffrey dispatch another terminator. Desperately, the nearest squad moved around, hoping to damage the venom and take the Dark Eldar objective, or at least contest it. They failed miserably. The fleeing Night Lords accomplished nothing, whilst the unit guarding the Imperial Fist managed to kill a solitary Scourge. The manufacturer of the ghostplate armour was noted, as they passed two out of three invulnerable saves to the heavy bolter. Geoffrey killed another terminator, leaving just one. Dark Eldar Victory! with a near-certain tabling of the Night Lords in turn five, and even if this could be avoided there was no chance of anything other than defeat. Your opponent got unucky with some of the morale rolls, it seems! The fear ensuing dark eldar, striking fear into even the most gnarly of foes! Nice write up and a solid victory! Not sure I agree with nurgle being the best theme for nightlords (I would got khorne for savagery or slaanesh for speed). Sure nurgle gives them fear, but T5 is most unthematic for a legion almost entirely bereft of mutation! Thanks for sharing the pain! Sneaky Geoffrey is sneaky!